How to make a competitive content marketing business? This is a question that is often asked by business owners who want their services and/or products to become well-known on the market in order to garner a following and thus consistent meaningful profit. There are ways to make this happen, but there are several steps that one should undertake (below). The 411 on Structuring a Competitive Content Marketing Business. This is a question that numerous business owners tend to not ask themselves; therefore, their content ends up not being engaging and thus not able to stand out. Contrary to popular belief, it is best to write for a particular group than writing with the intent of capturing the attention of everybody. Just take a glance at the current and past television programming. All the television programs that one can watch have always been geared toward either an age group or a specific group of people. There are soap operas, which are serial dramas that are produced for housewives. They come on around lunchtime, as producers know that this is the time when housewives take a break from cleaning and cooking and want to relax in front of their TVs. There is QVC, a channel geared toward men and women who want to purchase items but prefer to do so from the comfort of their own homes. There are also the Disney Channel and the Cartoon Network, which were created solely for children, as there were no channels for them. Due to asking themselves what type of audience they wanted to attract with their channels, the creators of these television networks were able to become the go-to option for their respective audience. It is important to note that content marketing is not a short-term strategy; it is a long-term strategy that is based on structuring a strong relationship with the audience that you are targeting by providing them with content that is of high-quality and always consistent. Walt Disney once said, “We keep moving forward, opening new doors, and doing new things, because we're curious and curiosity keeps leading us down new paths.” This is very true. Disney kept moving forward, trying to make the industry take a 180-degree turn, showcasing new things that would attract his target audience. We must say that he did not fail one bit in doing so! A great strategic marketing approach is one that focuses on creating consistent, relevant, and valuable content. In order to stand out with your content, you must first analyze the content that is being produced by competitors. By taking inventory of the content of your competitors and evaluating its quality and quantity, you should then go ahead and think about how you can provide content that is superior. There are a lot of major companies around the world that were able to achieve their current success due to analyzing their competition from the beginning; take McDonald’s and Walmart, as the perfect example of this statement. Before the fast-food restaurant McDonald’s was established, the eight brothers who created it analyzed their competition. At that point, there were a few fast-food places in the country, including White Castle in Kansas, but there were none in Illinois, making it the perfect opportunity to present the community with this type of restaurant. The McDonald's brothers knew that if they opted to establish the common type of restaurant that everybody was used to seeing, it would just become one of the bunch. Being just another fast-food restaurant was not enough to stand out, even if they were the only ones in town; therefore, the McDonald’sbrothers decided to provide a unique menu. This is a perfect example as to how you should do your best to provide superior service to your visitors. Due to the founders doing this, they were able to beat their competition in the profit department, making these fast-food restaurants stay behind. Right now, McDonald’s is the largest fast-food restaurant chain in the world. It can be found in 119 countries, and it appears that this number will continue to grow. One of the biggest mistakes conducted by business owners is just opting to provide valuable content utilizing one medium. You should take advantage of all the mediums that are available. There are several online companies that have been able to become popular due to providing blog articles, podcasts, webinars, videos, eBooks, presentations, and even newsletters. It is important to establish that these tools should go hand in hand with the services and/or products that you are offering the public. Now, there are many companies that provide them for a fee, which is a huge mistake. 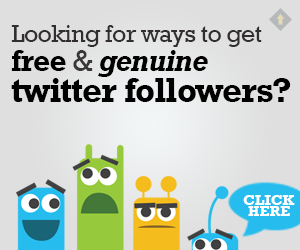 You should provide them with 100% free of charge in order to build a strong relationship with your audience. Profit can definitely come later. Take a look at wordpress.com; this website offers a lot of different tools for free, but it also has a section that sells tools that can bring their members even more benefits. Due to providing free tools, they have been able to capture the attention of the public, not scaring them away. Offering free things can actually help you target your audience quicker, which is the main goal that you should want to attain at the end of the day. If you were asking—How to make competitive content marketing business?—now you know how easy it can be if you take the previously mentioned into consideration. Those great companies that are on the market have already done so and thus have a strong relationship with their target audience. Put them to the test so that you, too, can begin to benefit from this and other aspects. Online Entrepreneur, Content Marketing Expert, Freelance Writer And Developer Of Online Business. Blog Writing Service. There’s an old saying: “the Cobbler’s children have no shoes”. It’s in reference to a Cobbler who is so busy making and mending the shoes of his clients, that he doesn’t have time to make shoes for his own children. Sound familiar? It’s a phrase that applies perfectly to digital agencies because so many devote themselves to the growth of their clients to such an extent that they forget about their own needs as a growing brand. Deepak Shukla, the Founder of London-based Pearl Lemon, an SEO and B2B lead generation agency, has managed to strike the balance between making shoes that his clients love, while spoiling his own proverbial children with shoes that the rest of us would love to try on for size. Deepak Shukla founded his agency Pearl Lemon in 2014 — but that’s not where his journey began. After completing his Bachelor of Arts degree in English Literature from the University of Warwick in 2008, Deepak went on to work with MEC, one of the world’s leading marketing agencies. He was 1 of just 6 hires out of 500 applicants. Later, he spent time at Deloitte before starting his first business, Meet My Tutor. Fast forward to 2014 and Deepak launched two additional companies as he travelled the world. The first was “The CV Guy”, which specialized in getting students into top universities. The second, was Pearl Lemon. Outside of business, Deepak is a serial marathon and ultramarathon runner, a TEDx speaker, has lived in 9 different countries and backpacked across 40 more. He even lived homelessly for a week for the sake of a YouTube documentary. Over the years, Shukla has amassed 18,000 LinkedIn connections, 20 million Quora views, 250,000 YouTube views and over 15,000 Udemy students. Finally, his agency, Pearl Lemon, is responsible for over $27,000 in monthly revenue. To learn more about his success, I sat down with Deepak Shukla to get to the bottom of his clearly awesome social media strategy that spans Quora, LinkedIn and YouTube. Under the leadership of Deepak Shukla, Pearl Lemon has mastered a four-tier social media strategy that has allowed them to reach millions across numerous platforms — landing clients in the process. Here’s a breakdown of that exact same social media marketing strategy. If Pearl Lemon is known for one thing outside of SEO and lead generation, it’s his video content. Through various YouTube channels, the brand uploads content to YouTube almost daily. Meanwhile, Deepak Shukla is busy recording video content for the sake of his growing LinkedIn audience. “I’m a huge fan of video content because it helps build more meaningful relationships compared to written content,” he said. “I haven’t gone viral with my videos at all, but video is massive for me anyway. Why? Because even my videos that don’t get many views are a massive help when it comes to driving conversions,” he said. He went on to explain how videos “help build meaningful relationships” and “scale trust”, calling it an extremely powerful medium for those same reasons. According to Shukla, prospective clients who want to do some quick due diligence are ecstatic when agency owners have video content readily available. “it gives them a sense of who I am and what I’m about. I’ve had multiple clients who cited my videos as a reason for reaching out to me. So yes, video content has been really significant to me,” Shukla revealed. When I probed Shukla about how he’d managed to attract over 250,000 YouTube views, he told me that his dedicated YouTube SEO manager does a lot of the heavy lifting. “That goes to show that YouTube isn’t just about uploading content, you need to optimize it like you would do for a blog post. So I strongly recommend agencies get somebody to help them with YouTube SEO,” he said. He also urged agencies to run paid ads to their YouTube channels, and to invite relevant guests onto video interviews and discussions to discuss trending topics. Finally, he advised that agencies shouldn’t be aiming for scale in terms of views, but for scale in terms of value to clients and prospects. It’s simple: record more video content, particularly video content where you and your agency executives can address topics by directly talking to the camera in selfie mode. You don’t need fancy camera equipment or even a fancy camera. Deepak Shukla makes do with his trusty Android phone for most of his recording, so what’s stopping you from doing the same? To blend his personal anecdotes into his business tips and insights, Deepak leverages storytelling — a lot. He writes snappy LinkedIn updates that are essentially flashbacks to either family events, wise words bestowed upon him by different figures in his life, or recent client interactions. To wrap the update up, he gleans a lesson from the situation, making it an entertaining, educational and memorable story to help solidify his personal brand as well as Pearl Lemon. Moreover, Shukla uses YouTube to shed even more light on his personal life. His channel is home to videos from his travels, discussions with his grandparents and an explanation as to why he has “taken a path less trodden”. While there’s nothing wrong with exposing elements of your family life in order to tell stories, there are plenty of other ways to get the job done. You can share interesting conversations from past jobs, funny situations from your life at college or pretty much anything else, so long as it's a story your audience can take benefit from. While most agencies focus on expanding the impact of their clients on social media, Pearl Lemon makes a point of setting aside time for themselves. Shukla posts LinkedIn updates almost every day, and sometimes multiple times per day. That may not sound like much, but I’m not talking about publishing curated content and other fluff. When Shukla posts an update, it’s not just routine, it’s meaningful. Moreover, his daily LinkedIn updates are accompanied by regular YouTube uploads and speaking gigs which helps promote Pearl Lemon and its SEO expertise even further. This same work ethic can be found on the Quora platform, where Shukla has answered 1,147 questions, making 3,489 edits in the process to hone his messaging. “There’s no secret, it just takes massive hard work. I outwork my competition. I stay consistent on LinkedIn, while most agency owners simply don’t,” Shukla told me. “At one stage, I was writing out ten answers on Quora per day. For LinkedIn, I post content daily and I engage with other people’s content multiple times a day,” he continued. To stay truly consistent over a long period of time, you need to allocate a dedicated time slot to your social media marketing strategy. That may include blocking out one hour every day, or one day every week, just to create and schedule social media content. Perhaps the most important part of Pearl Lemon’s social media strategy is the fact that they go a mile deep whilst going pretty darn wide in the process. In fact, Deepak Shukla has managed to implement the three steps above on multiple platforms, amassing over 40,000 followers across LinkedIn, Instagram, and Twitter. Identify a list of social networks that your audience frequents. Make your list just long enough to make it seem like your brand is “everywhere” without spreading yourself or your team too thin. Then, refer back to layer #3! Deepak’s extensive use of video content is also an example to all agency owners, and as platforms like Instagram grow stronger by the day, it’s a strategy worth adopting sooner rather than later. Treat your agency like a client in order to avoid the ‘Cobbler’s children’ pitfall. Video breeds trust, so make videos at scale, wherever you are, and even if you aren’t using state-of-the-art equipment. Stay consistent. Much of Deepak’s success has come through doing the simple at high frequency. Got any other #AgencyGrowth tips to share with our community? Share yours and tweet at us on Twitter! Want to see how Core dna can grow your agency and your clients' business to the next level? Let’s chat. In 2009, I originally published this post, the 3 Types of Affiliate Marketing Explained—and The One I Profit From. 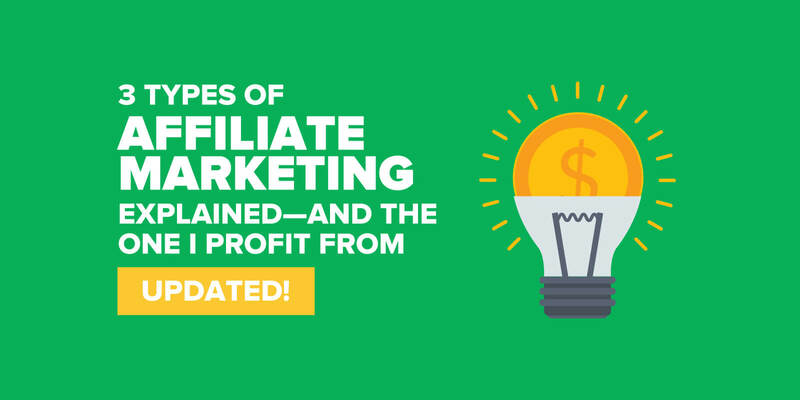 A lot has changed since then, and I’ve learned a ton along the way about affiliate marketing the right way. It’s now October 2018, and I wanted to share those new insights here, with a bunch of new takeaways for you to bring affiliate marketing into your own business! Ready to dive in? Let’s do this. In my November 2009 income report, you may have noticed that my affiliate income had surpassed my direct income from the electronic products that I sell online. I received a lot of comments, asking me to explain more about where my affiliate income comes from and how it works. Instead of just breaking down where it all came from—how much this and how much that—I decided to turn this post into something a little bit more useful that would do more than just tell you how much I earned. Again, I’m not here to show you the money I make online, I’m here to show you how I make money online, and what I’ve learned along the way. When thinking specifically about affiliate income, I determined that I could divide how people earn money as an affiliate into three primary categories: and Involved. These terms represent how we are associated with the product or products we may be an affiliate for. These are your basic pay-per-click affiliate marketing campaigns where you have no presence and no authority in the niche of the product you’re promoting. There’s no connection between you and the end consumer, and all you’re doing is putting an affiliate link in front of someone via Google Adwords, Facebook ads, etc. in the hopes that they’ll click on your link, buy the product, and earn a commission. The reason why this type of affiliate marketing is so attractive to many is because no presence or authority is needed! It takes time to build up a reputation and trust with certain groups of people online, and many people are just too scared to commit to working on a blog or website, or just don’t have the time. For many, this is their only option. Personally, I don’t like this business model because to me, this is not a business model. It’s an income generating model, yes, but is it a business model where I can build relationships with the end user? No. With PPC affiliate marketing, you become a behind-the-scenes middle man. With this model, there’s pressure to focus more on the potential income rather than the customers you’re serving. 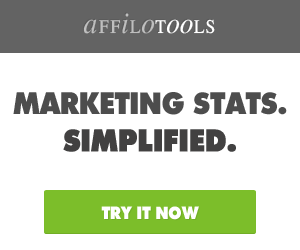 That’s the dark side of affiliate marketing. And that’s not for me. In fact, in early 2009 I tried something similar once. I signed up for an affiliate network and found thousands of potential products I could promote. I chose one and spent about $250 dollars on Adwords hoping someone would click on the link and I’d get paid. If you dabble in PPC affiliate marketing and it’s working for you in a way that you’re instilling trust in your audience, I applaud you and wish you continued success. It’s a lot more difficult than it sounds, so props to those of you finding success with it. Another form of affiliate marketing is what I like to call . This is where you have some sort of presence online, whether it’s through a blog, a podcast, videos, or on social media—and you have affiliate links to products related to your niche, but they’re for products you don’t actually use. Back when text link ads were a big deal, I remember seeing every single “make money online” website with a 125 x 125 pixel advertisement for Text Link Ads, which was an older advertising model where you could have advertisers pay for having specific terms on your website become links to their products. This was big in the blogosphere when I was just starting out. Most of these sites did not actually use the text link ad service on their own sites. On many personal finance blogs, you’ll see a lot of different affiliate advertisements for things like ING, Everbank, LendingClub, and numerous other financial institutions. In my early days, I used to have a few of these links scattered throughout SPI—for example, an ad for a “How to Make an iPhone App” product. I used to have a few iPhone apps that generated an income for me each month, but I didn’t actually use the product I was linking to. I did, however, personally know the owner, which is why I trusted him and decided to place that ad there at the time. Nowadays though, I don’t like to promote anything I haven’t tried and loved myself. How can I honestly say that I support a product if I don’t know everything there is to know about it? If you don’t promote the right products, even if you know the owner or think it might be a great fit, you run the risk of losing the trust you have built with your audience. It takes hard work to build authority and trust, and one bad affiliate offer could potentially ruin that, so be sure you trust the product you’re recommending, and the team behind the product to take care of your people. Involved affiliate marketing is where you’ve used a product or service, truly believe in it, and personally recommend it to your audience. Not in a banner ad or somewhere that says “recommended resources,” but within your content, as part of your life and strategy for whatever it is you’re talking about. The product almost becomes something people “have to have,” because it’s part of the process. It’s your involvement and experience with the product that makes that offer so attractive. I talk about this and highlight my top performing affiliate marketing products and how they’ve performed so well in SPI Podcast session 293. There is, however, a level of responsibility that you have to uphold while making these kinds of recommendations, especially if you have a lot of authority and influence over your followers. This is something I take very seriously. If it were up to me, this is the only way affiliate marketing would be done, because to me it’s the most honest and most helpful. This is the complete opposite of PPC, where you’re not even seen by the consumer in order for the transaction to take place. Instead, this is you talking directly to those who may need a product that you’re offering, who have their ears and eyes on you. This is not using your money in order to make money, like with PPC. It’s using your reputation, trust, and authority in order to get others to take your recommendation, use it and pay you something in return in the form of a commission. Bluehost and ConvertKit are two examples of companies I’ve created long-term, thoughtful relationships with because I love their products, value their leadership, and feel great about recommending them to my audience because I know my audience will benefit from the web hosting of Bluehost and email marketing of ConvertKit. These types of affiliate relationships are built on trust and authenticity. The same applies to how we should building relationships with our audiences. So, to conclude, I would say that you can choose which kind of affiliate marketing works best for you—or Involved—but in my experience, using your authority and presence in a niche to recommend products that you’ve used and have benefited you in some way is the best way to go. Focus on trust and authenticity. Focus on serve first, not income first. Focus on what is best for your audience. Be as involved as you can with the affiliate marketing process, and you’ll see success with your affiliate income. And if you are ready to take the next step in your affiliate marketing journey, be sure to sign up for my Affiliate Marketing Masterclass webinar! It’s free, fun, and you’ll learn how to monetize your brand in way that’s not sleazy or salesy. Want to try your hand at affiliate marketing and deliver even more value to your podcasting audience? The Smart Podcast Player affiliate program lets you reap the benefits while you “share the wealth” of the best podcast player for power users with your fans. Learn more and sign up here.